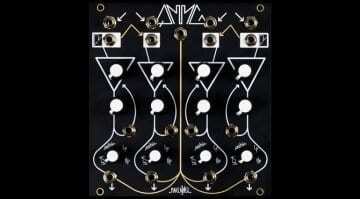 In February the Synthesis Technology E370 Quad Morphing VCO was funded on Kickstarter in a matter of hours. 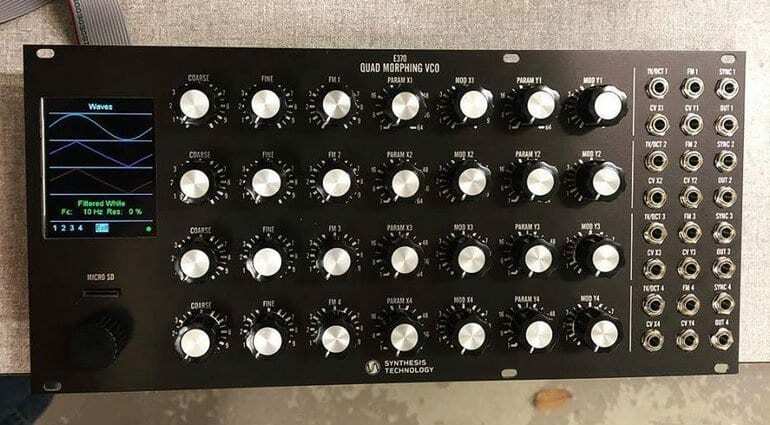 Such is the demand for this extraordinary 4-channel DSP-based VCO they ended up taking almost 5 times their $58,000 goal. Just got the news via Facebook that the Kickstarter pre-orders are starting to ship. Along with that came the exciting revelation that pre-ordering for the next batch has opened and for a limited time they are making it available with a beautiful black front panel. The 4 VCO’s are arranged in ordered rows across the face of the E370. They can be used independently, in two pairs or ganged together in unison. It incorporates algorithms from the now discontinued E350 Morphing Terrarium and E340 Cloud Generator. You’ll also find this combination in the current E352 Cloud Terrarium, but with the E370 Synthesis Technology have essentially doubled it up for more of everything. Although it’s much more than that. Features not found in the E352 include a programmable 64-entry Chord Table with micro-tuning; a fully assignable CV routing matrix; and the ability to mix any of the VCOs to independent outputs. 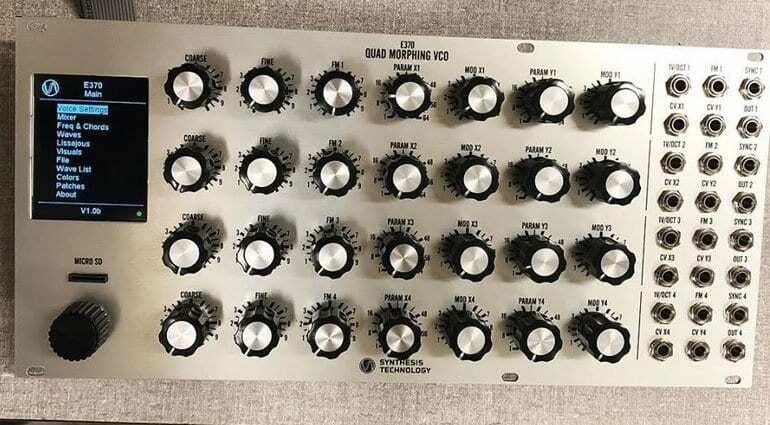 Each VCO can have its own set of 64 wavetables, it can save and load presets and comes with 192 wavetables from the E350. All of it in higher resolution 16-bit and 96kHz. The VCOs can run in four modes. Firstly as a regular wavetable synth. 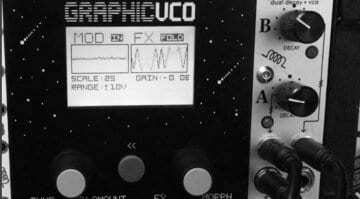 Then in Cloud mode it can generate up to 8 virtual VCOs for swarming and chaos infused sound creation. And then there’s an FM mode with 2 operators running either sine waves or wavetables. And finally, there’s a programmable noise generator with 8 algorithms and a Moog low pass filter with voltage controlled resonance. That’s a great deal of versatility and the 7 knobs for each gives a nice amount of controllability too. On the left is this rather nice screen which, if it only displayed oscilloscope waveforms would be awesome enough, but this has a whole menu system going on. It’s designed to be shallow and straightforward, with single pages for each setting or at the most one sub-page. There’s a rotary encoder beneath the screen for data entry. On the right are 24 patch points, 6 for each oscillator giving access to pitch, FM, sync and modulation. Any sort of explanation of the features is not really going to do it justice, although you’ll find plenty of detail on the Kickstarter page. The E350 and E340 were both regarded as amazing sounding modules. The current E352 Cloud Terrarium is considered one of the best and most interesting VCOs on the market. So the E370 was bound to get a lot of interest from those who could appreciate and afford it. 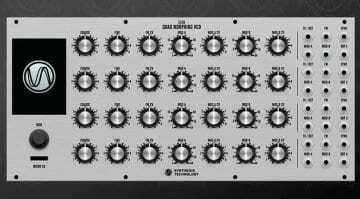 Synthesis Technology are now taking pre-orders on the next batch. These will not be ready until March 2018 but up until 16th December you can request the limited edition black panel. It looks great in the silver panel as well, but you’ve got to admit that the black does look rather tasty. You’ll not be able to buy this from any shop or in their own online store . 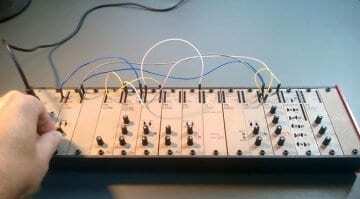 Instead, you have to join the SynthTech Modular Facebook group, and once accepted send Paul T. Schreiber (the person behind Synthesis Technology) a message and go from there. And remember the black panel version is only available to order until the 16th December and will cost you $999. So forget getting your kids anything for Christmas, this is far more important. In time they’ll understand. Just to note that the standard silver fronted E370 will be available from regular places worldwide after this batch has shipped in March. This explanation of the E352 by DivKid will give you a fair idea what to expect from the E370.